Indian PM says attackers aimed to "indiscriminately kill innocent foreigners"
(CNN) -- Travelers heading for Mumbai were urged to postpone their journeys Thursday amid fears that foreigners could be targeted following Wednesday's terror attacks that left more than 100 people dead and two luxury hotels under siege. 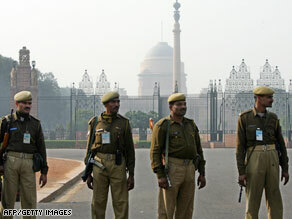 Indian reserve soldiers keep vigil outside the residence of the Indian Prime Minister on Thursday. In a televised statement Thursday, Indian Prime Minister Manmohan Singh said the attacks had been intended to "create a sense of panic by choosing high-profile targets and indiscriminately killing innocent foreigners." At least six foreigners were reported dead in the attacks including Italian and British nationals. The U.S. Embassy in New Delhi said the situation in Mumbai remained fluid and warned those planning to travel to Mumbai to postpone their journeys for at least the next 48 to 72 hours. "Those currently in Mumbai are asked to take shelter at their current location and contact family and friends," the embassy said in a statement. The U.S. Consulate General in Mumbai opened for emergency passport issuance Thursday despite the Thanksgiving holiday. "U.S. citizens who have immediate travel plans and have lost or damaged passports can come directly to the Consulate to obtain an emergency replacement passport," a statement said. The UK's Foreign Office advised against "all but essential travel to Mumbai until further notice." The French Embassy in New Delhi said those living in or traveling to Mumbai should be "doubly cautious" and warned: "Hotels, public places (markets, railway stations, cinema halls, etc.) should be avoided and movements outside restricted to a strict minimum until fresh instructions are issued." Australia's Department of Foreign Affairs and Trade urged Australians to avoid travel to Mumbai and told those already in the city to remain in a safe location and monitor the media for information about new security risks." Flights to and from India were largely undisrupted Thursday. A spokesman for Air India at Mumbai's Chhatrapati Shivaji International Airport told CNN the airline was maintaining a normal schedule and said there had been no cancellations or major delays. Singapore Airlines urged passengers to allow extra time for check-in because of additional security checks at the airport's perimeter. A spokeswoman for London's Heathrow Airport told CNN services were operating normally. British Airways was running a regular service to Mumbai but said customers with bookings made prior to the attacks could rebook on a different date or to an alternative Indian city at no extra cost. The Taj hotel chain, whose flagship Mumbai residence was attacked by gunmen, said it was working closely with authorities and was taking "necessary precautions" across all its hotels. The Oberoi hotel chain said it was "monitoring the situation closely" and cooperating with police and government authorities. Meanwhile Indian cricket authorities have canceled the remaining two matches of India's one-day series with England and postponed the inaugural Champions League tournament which was due to start next week. Participating teams from England and Australia had been due to fly to India on Thursday.